The World Cup Group F final between Argentina and Nigeria finishes with Argentina winning 3-2. The duel between the much-storied Lionel Messi and the relatively little-ballyhooed Vincent Enyeama created an immensely captivating match. The World Cup exploits of Messi, FC Barcelona’s wunderkind, have been much publicized. His second-half goals in both of Argentina’s previous wins have been praised widely, especially his injury-time strike to beat Iran 1-0 on Saturday. 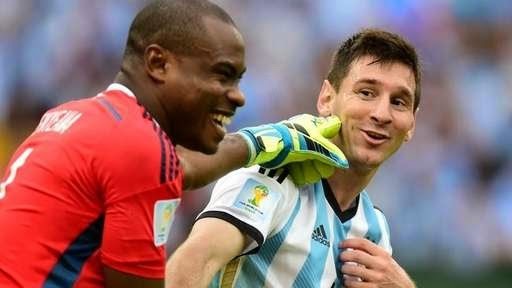 But with Nigeria scoring one goal in its two previous matches, Enyeama likewise has been carrying the Super Eagles, the only team yet to concede a goal at the World Cup. The 31-year-old goalkeeper, who plays for Lille in France, reportedly is drawing interest from Arsenal and Sunderland. Neither Messi nor Argentina needs to duel with Nigeria. They’ve already clinched their place in the last 16 with six points, and need merely a draw to finish atop the group. That would get Argentina a second-round match against the runner-up from Group E, the France-Ecuador-Switzerland-Honduras group. Nigeria, however, is in a precarious situation. With four points, it sits three ahead of Iran, which plays pointless and eliminated Bosnia-Herzegovina in a simultaneous match. A draw would get it through without having to worry about the Bosnia-Iran result. But a Nigeria loss and an Iran win could send the “Princes of Persia” through. It will all depend on goal difference, or possibly goals scored. Nigeria has a plus-1 goal difference, Iran a minus-1. A 2-1 win by Iran combined with a 1-0 loss by Nigeria would send the Iranians through. But a 1-0 win by Iran joined with a 2-1 loss by Nigeria favors the Africans. Of course, Iran has won only one game in 11 tries at the World Cup, in 1998 against the United States.